RUSH: This is Mike in Canton, North Carolina. You’re next. It’s great to have you. CALLER: (static throughout) Thanks, Rush. I appreciate you taking my call. RUSH: You bet, sir. Any time. Any time at all. CALLER: Well, I have two things for you today. One is a tech question about the app, and the other is a comment about the New Deal. 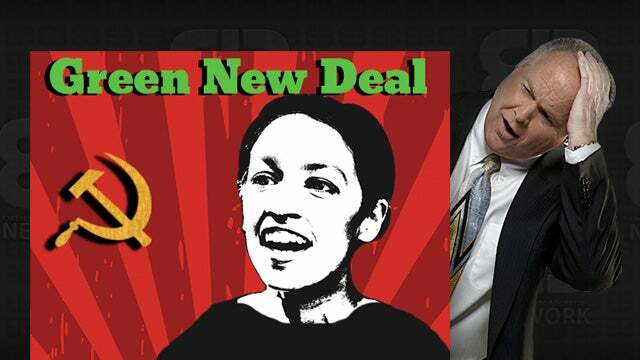 RUSH: The Green New Deal? CALLER: The Green New Deal. Which one would you like? RUSH: Well, go with the tech question first. CALLER: Okay. Well, my wife and I live in one of those austere places way off the beaten path. The best internet we can get is DSL, and one of the best ways to watch or get your show on the 24/7 would be the Apple TV, for us. But there is no app for the Apple TV. 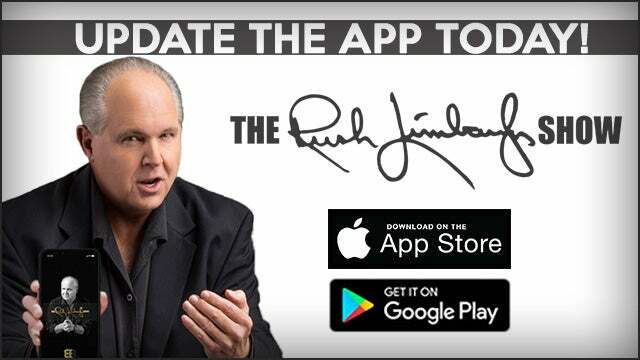 RUSH: I have wanted an Apple TV version of the RushLimbaugh.com app for I can’t tell you how many months. I am not a developer, meaning I don’t write code. We have to farm that out. RUSH: And I’m being told something I don’t believe. I’m being told that it would cost $500,000 to write an app for the Apple TV, and I simply don’t believe it. If that were the case, there wouldn’t be as many as there are. The CARROT Weather service would not have an Apple TV app if it cost $500,000 to do. RUSH: Not only that, I want the RushLimbaugh.com on CarPlay so that you can listen to it on your phone via the internet driving around through your car’s audio system, and I’m told that costs $250,000. I know what some of you are thinking. “Rush, how can you be a prisoner to this? You are Rush Limbaugh. Just order it done!” Well, folks, it’s a little bit more complicated than that, but I’m really hell-bent on getting a Rush Limbaugh app on the Apple TV. What do you watch most on Apple TV? CALLER: Actually… Well, we use our Apple TV with Plex, which serves movies up to us from our own server. RUSH: All right. Have you purchased a streaming service like DirecTV Now or YouTube TV or any of that? CALLER: No. I have… Uh, it’s complicated. RUSH: Do you have cable? CALLER: We do not. We can’t get cable. We are 950 feet from the nearest cable whatever you want to call it — part of the plant — and they say they can’t run cable to our house without running a trunk down to somewhere near the house. RUSH: That’s probably true. That’s how it was in all small towns when cable was getting going, until they actually got it built out. Well, so, how do you watch TV? Do you watch Fox News, for example? CALLER: We do, but once again, it’s complicated. We have a rental that we buy cable for and that we can actually sign in to watch Fox News through the subscription for the rental. CALLER: So we got an Airbnb type of thing. It’s complicated, Rush. But your Rush 24/7, we’ve been members since you first started it, and it is something that we take advantage of when we are traveling to go see the kids in the car. RUSH: Oh, let me tell you something. I’m appreciative of you saying that. It is the best way to access this program when you’re on the go, right there on your device. All you need is a decent, halfway decent internet connection. If you’re a subscriber, you’ve got the Dittocam, you’ve got archives of all this stuff, you’ve got the podcasts. That’s why we’ve redesigned it and built it up and we’ve really tried to make the user interface as intuitive and fun as possible. But, man, you’ve hit kind of a sore spot with me. Because not only do I want a RushLimbaugh.com Apple TV app, I want it on CarPlay as well. I want it everywhere that people are accessing content. Now, you could use AirPlay on the app if you’re a subscriber, video or audio. You could AirPlay the video or audio to your Apple TV, but I would much rather have the direct app that features the live Dittocam every day and then archives of it. Someday it’s gonna happen. It’s just a matter of things I can’t get into here. But in some cases it’s priority. The same thing with the CarPlay app. I want to get on the cutting edge and the front edge of this stuff, because content is king — content, content, content — with the changes rapidly coming in distribution. It used to be people watched cable TV. Cord cutting is happening at a massive rate. These streaming services that you can buy for Apple TV or Roku or whatever service, whatever streaming box you use… I just saw that PlayStation Vue is one of them. It’s owned by Sony. PlayStation Vue just today dropped an update that allows you to watch four channels at one time on one screen. I mean, the tech here is exploding. So on your screen you could have CNN (if you wanted), then Fox over here, then PMSNBC, or you could have — during March Madness — two or three games at one time if you have a package on PlayStation Vue that covers these things. YouTube… They all have cloud DVR so you can record programs and watch ’em later, and it’s all done in the cloud. This is what people are signing up for as they cut the cord from cable, and you’ll want to be there. You want your content to be there. We’re constantly striving for it. Now, the other question that you asked…? What was the other question you asked? RUSH: You know, I have been thinking about this too. I have a lifetime, 30 years on this program, of attempting to penetrate skulls full of mush on this whole subject of climate change and global warming and all. And I have found, Mike, that in the example of the Green New Deal, your way is of course impeccable. It is incontrovertibly true how much petroleum is a factor in daily life, including eating. But my experience has been that going down that road ends up in a bunch of foggy deer-in-the-headlight eyes, and it’s not the way to persuade people who have an emotional connection to what they think is something that’s going to save their lives, i.e., by saving the planet. But it’s very tempting to get in the mud. So how do you do it? You’ve got to get out of the weeds and the minutia and you have to start trying to convince them what their life is gonna be like if they get what they want. And you can include how much they’re gonna pay in tax, but you also include how their life is gonna change, that 90% of the creature comforts they come to take for granted and expect, if we actually did this Green New Deal, would vanish and would end. And then list them one by one by one. And even then, I wonder how successful anybody’s gonna be at changing their minds because this is youthful, almost religious attachment, to something. It’s not the result of reason. It’s not the result of thinking. There’s nothing intellectual about their attachment to this issue. It’s all “I, me, my.” It’s all about them, and it’s all about the world ending before they have a chance to live their lives. And it’s a real challenge to get to them. The greatest thing that’s gonna change their minds is age, but people who don’t want to wait for that to happen still want to take their best shot at it, as do I each and every day.